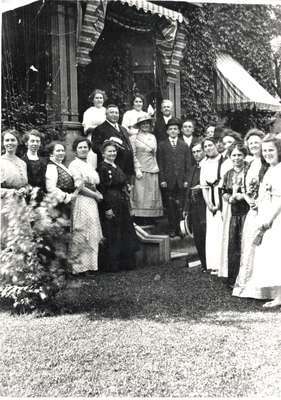 Black and white, outdoor, group photograph of people on front steps and lawn of large home, possibly the residence of August Boehmer, in Berlin, Ontario. The women standing on the lawn on the left side of image (starting at far left to right) were identified as Nettie Boehmer Shoemaker, Mrs. Norman Boehmer, and Edna Boehmer Lautenschlager. The woman in the dark dress at the end of the row, standing beside steps, was identified as Katherine Boehmer, wife of August Boehmer. August Boehmer was identified as the man standing on the step behind Katherine, holding a boater hat in his hand. Emma Boehmer Yanke is standing on the step behind August, and to her left, on the same step, is Gertie Boehmer Hallmann. On the right hand side of the image, the third woman from the right, standing on the lawn, wearing a dark dress, was identified as Dora Boehmer Hymmen. Further along the row, the woman, in the light dress with hands folded in front, was identified as Mrs. George Boehmer. Photograph is a copy of original. Names of subjects provided by donor.